Still more stuff for sale. Took some of the parts from my last thread to create a fully functional gun, plus some grenades I'm looking to sell off. 1) PM with all offers. 2) I accept the trades listed below. 3) I prefer to transact face to face, but will ship if you cover the cost. 4) For shipped trades, you ship first unless you have a higher iTrader on THIS forum. 5) NO PART OUTS. Don't even ask. 1) TM / CYMA / E1 M14. Black SOCOM version preferred. 2) Flyye / Pantac MAP/MBSS Hydration pack in CB. 3) TT MAV in RG. 4) TT Pouches in RG. 2x Universal mag pouches, a SAW pouch, canteen pouch, and double pistol mag pouch are what I need. Put this together over the weekend, starting with a KA Bushmaster trademarked lower ($50) and a stock KA gearbox ($50). Added an E1 M16 stock and outer barrel, a MOE handguard in FDE (~$30), a Dboys metal upper ($20), a Madbull 6.03 TBB ($40), and a JG metal hopup ($20). There are two problems. First, the upper is pretty wobbley. The previous owner filed the rear down for some reason, so it doesn't quite match with the KA upper. It stays in place, but will need replaced. Also the fake bolt cover is too short to cover the hopup unit. Its not necessary to function, its just there for looks. Asking: $100! (Dropped)firm with these problems. The slightly longer outer barrel has been substituted for a standard MP5 threaded flash hider. One of my recent projects, it is nearing completion, and I'd like to list it again. Now in complete functional condition! I fixed it today. Still has two minute problems: the mechanical safety doesn't engage (electrical safety still cuts circuit, so the safe position works); And the charging handle doesn't pull all the way back. It has a Jonezy HUTU (Hopup Tracer Unit), wired to the front, and the GB is wired to the rear. Comes with one functional midcap and a magazine shell (non-functional). It has a full stock and a RIS unit. 3) 6 x 40mm Grenade Shells. 4x ACM metal grenades (120 rounds each) 3 SOLD. 1x Pro Arms POM grenade. Non functional, needs a new fill valve and bearings. Will sell the remaining three (1x ACM, 1x CAW, 1x Pro Arms) for $35. That's it. Message me for offers. Pics will be up tonight. Bumperoni. Pics added. Considering parting out 3x ACM grenades for $50. Offer up. Bump. Three grenades sold, the other three are no longer for sale. Some interest in the M16. Bump. Gun added, prices dropped, trades added. Bump it up. Everything still for sale. All grenades now gone, M16 and HK53 bumped and DROPPED! 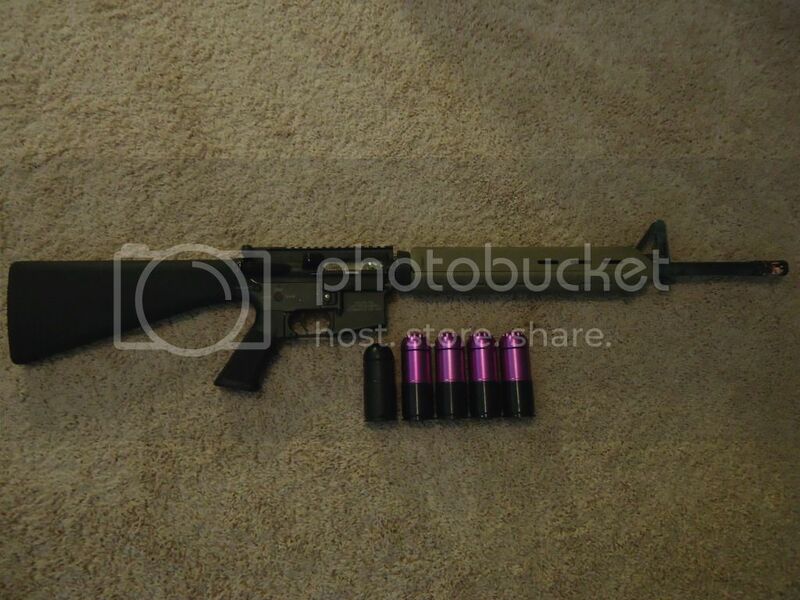 Looking for an M14 and mags to go with and EBR kit I ordered. Bumperoo. Have you seen these prices...? HK53 is now totally operational.